Casual skirt, tank and jacket make this a perfect weekend outfit. The tank can stand alone thanks to the necklace. Yeah! It’s the weekend! You know what that means, casual wear! Before I started this fashion diary I would have worn sweat pants and a t shirt on the weekend. But I’m forcing myself to get dressed every day- so here goes. I said this last week, but I’ll say it again- I’d rather wear a skirt than shorts. It’s so much more comfortable- and you know me- all about comfort! One thing I really like about skirts is that if they have a cool color or pattern- they make the entire outfit interesting. 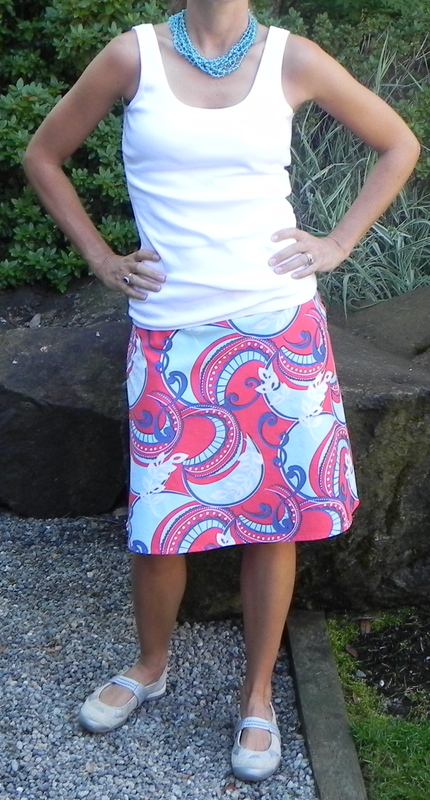 So, today I am wearing a bright red, blue and white skirt. The pattern is so busy that I kept it simple on top with a plain white tank top and a denim jacket. If you don’t own a denim jacket, I strongly recommend it. I throw it on over just about everything. Not only does it add warmth, but it’s a great way to ‘dress down’ an outfit. To tie the entire look together I am wearing a necklace from Kohls that picks up the blue from the skirt- and my casual slip on tennis shoes. The casual shoes are great for running errands.